Although Pralines are wonderful any time of the year, in the South they are a tradition during the Christmas season. People around here serve them at parties and give them as gifts. They aren't hard to make (although you have to develop the "right touch"), yet they are considered delicacies. They originated in New Orleans, a mere 90 miles from where I live, so I see them in quite a few places. It's fun to watch them being made at the praline shops in the French Market in New Orleans and in Southern candy shops. It's also fun to learn to make them yourself! Pralines were first made in France more than 200 years ago. During the 17th century, a count named Cesar de Plessis Praslin created this candy as a calling card when courting famous women in France. He made it by boiling nuts in sugar. It became popular confection. In his day, the praline was made with almonds because they were the most prevalent nut in France. When French colonists came to Louisiana, native pecans were substituted for the almonds. In that time, almonds were used to make the caramel-coated confections. When the French settled in New Orleans, they began using pecans because they were more plentiful. The Louisiana Creoles added milk to the recipe, resulting in a creamier candy. The rest is gourmet history. Pralines are rich, yummy and very addictive. There really isn't another candy confection in existence that has the same flavor. I've collected a number of praline recipes over the years, so I have quite a few to share. Before doing this page, I tested four of them. The first recipe I am putting here first is by far the best of the four. I've adapted it, using the best of several recipes. It cooks in a reasonable time, has a creamy texture, a good flavor, and hardens well. (2) When to stop beating them and start spooning onto the waxed paper. You may have to practice a few times before you perfect your skills, but they are basically easy to make. Purchasing pralines can be expensive, and often times they are crumbly, or are old, or don't have a very good flavor. You can't beat homemade pralines that turn out "right". Go to the bottom of the page for "problem" question answers. Combine all ingredients except the pecans and vanilla in a heavy saucepan. Mixture will be thick. Stir until it comes to a boil, then turn heat down to a low boil. Stir occasionally and sparingly; spoon mixture up on sides of pan to melt any sugar that hasn't melted. 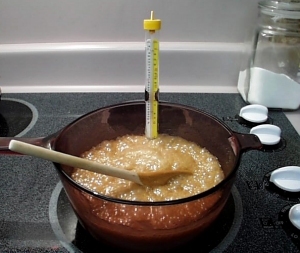 Cook until the mixture reaches 239 degrees with a candy thermometer. If you don't have a candy thermometer, bring it to the soft ball stage. I find that they do better just a few lines below 239 as they don't harden quite so fast and make it easier to spoon into pralines. Remove from heat. Stir in the vanilla and the pecans. Stir until the mixture begins to thicken and becomes creamy and cloudy. Spoon onto waxed paper to harden. What usually happens is that by the time the mixture turns cloudy signaling that it is time to drop onto the waxed paper, it starts hardening too fast to drop correctly. You should then stir in about 1 - 2 tablespoons of warm water to thin the mixture. Don't add too much - just enough to make the spoonfuls drop and settle in a "puddle". You don't want them to look like chunks of rocks. If cooked to the correct temperature, it won't take a minute to harden by stirring. If you don't cook them long enough, they remain "sticky" and never become firm. They should be firm, yet creamy. If you don't eat them all the first day <g>, wrap them individually and store them in an airtight container. Below the recipe you will find some tips and tricks for making no-fail pralines. Recipes in which the butter is cooked with the sugar and milk seem to turn out better, cook faster, and taste creamier. Cook to the correct temperature - 239 degrees. 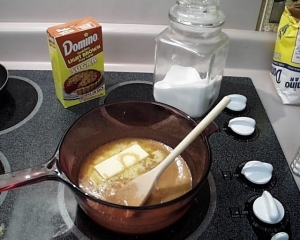 If you use a recipe in which you don't put the butter in while cooking, don't cook that long. Cook only to approximately 210 degrees. Don't let it go beyond the soft ball stage. If you do let it reach the hard ball or "thread" stage, it won't crystallize and be soft. Assemble all of your ingredients before you start. Have the pecans and the vanilla ready, and have plenty of waxed paper laid out and ready. Have your spoon ready with which to drop the mixture when it starts to harden. Spoon them out on a cutting board or a cookie sheet covered with waxed paper. They are very hot and may damage a table or counter. Also, the mixture is so hot it will melt the wax onto your counter and it will have to be cleaned off with scouring powder. Try several recipes and decide for yourself which you like best. Sometimes they tend to have little cloudy spots in them. This happens when they have gotten too hard, and probably comes from the "foam" that occurs when the mixture is cooking. Adding that little bit of water tends to get rid of the spots on the hardened pralines. I've gained several pounds while doing this page, so I'm not going to test them all again <smile> They are from people who say they are very good recipes. (Note on my recipe card: "Tried 2/1980 - Very Good"
Mix sugar, soda and milk. Bring to a boil, reduce heat. Cook, stirring constantly, over low heat, until mixture forms a soft ball in cold water. (This one probably shouldn't reach 239 degrees) Remove from heat; add vanilla and margarine. Stir in pecans. Beat until creamy. Drop by tablespoonfuls onto waxed paper. Cool until set. Wrap separately to store. Combine sugars with milk in a pan. Bring to a boil; turn down heat and cook until it reaches the soft boil stage. Remove from heat; stir in pecans. Beat until creamy; drop onto waxed paper to cool and harden. Caution: Do Not let this recipe go over 210 degrees. It was one of the trial recipes for this page, and without the butter in the mixture while cooking, it will burn very fast. Quick and easy! In a 2-quart bowl, combine sugar and whipping cream. Microwave at high for 10 - 13 minutes or until soft-boil stage; stir halfway through cooking. Stir in margarine, vanilla and pecans. Microwave at high for 2 more minutes. Beat 2 minutes until glossy. Drop by tablespoonful onto ungreased wax paper. Yields 24 pralines. Combine the sugars, salt, milk and cream of tartar in a large saucepan. Stir over low heat until the sugar dissolves, wiping the crystals from the sides of the pan with a rubber spatula. Once it's dissolved and you start letting it cook, DON'T wipe... it will make it grainy). Cook to 236º to 238º on candy thermometer. Immediately take pan off the burner and let it cool to 220 degrees. Add the butter, vanilla, and pecans and beat until creamy with a wire whisk. While it is still soft, drop by spoonfuls onto a piece of waxed paper, leaving about 2" of space between each spoonful. Work fast before they start to harden. When the pralines are cool and firm, you can wrap them. No, I don't have this recipe. People keep e-mailing to ask me for the recipe. I can't imagine them being as good as the real thing. I suggest you look through some old recipe books, or do an Internet search. I also don't have a recipe for coconut pralines. The regular ones are good enough for me <g>. I'm often asked about a recipe for Chewy Pralines. I suppose they are more like caramels than the traditional firm and sugary pralines from Cajun country, but since I've never eaten one, I don't know what they taste like. People say they are delicious, but it's hard to imagine them being better than the Southern praline. I'm sorry, but I don't have a recipe for them. I only make the traditional ones. You might want to do an online search if you need a recipe. Sorry, but I don't have any other recipes concerning pralines. Someone asked about a praline dessert cup she got at a restaurant in Seattle that had a thin praline cup that held ice cream . She said, "On top of the ice cream were 2 or 3 chocolate truffles which had been rolled in a graham cracker crumbs, butter and finely chopped pecan mixture and then they were deep fried. When you broke into the truffle outer shell, the melted truffle oozed over the ice cream and praline shell. It was to die for! ". Sounds like it was sinfully delicious. If you have that recipe, please send it and I'll add it here. Just wanted you to know that your selection as your favorite praline recipe is the absolute best. Just to let you know, it seems to also come out well when you substitute condensed milk for the half and half. I'm a praline connoisseur and I always try a new one when I find a different recipe. That one is the best. I get e-mails from people who have had problems with their pralines when something goes wrong with their trying to make pralines for the first time. I usually take the time to write them back, but things are repeating themselves, so I shall attempt to answer how to prevent problems here for all to read..
Let me tell you a little bit of my background. My mother was a wonderful cook. She loved to cook. My daddy had to have lunch at 11:00 every day and at 5:00 every night because of his work schedule. He came home for meals as he owned his business. Mother never taught me to cook real food because she had her ways of doing things, and, honestly, I don't think that she had the patience to teach me when she was under such a deadline to put a meal on the table. However, I loved to make great cakes, cookies and candy, usually when she was taking a nap in the afternoons, or after she woke up. I started making the old fashioned Hershey's fudge that you had to cook at a fairly young age, and did a pretty darned good job of it. I made all kinds of fudge, divinity, Date Nut Loaf, fondants, Marzipan candy (the prettiest and most perfectly formed pieces of fruit candy you ever say - even nicer that what I paid about 7 Euros for one piece of Marzipan in Italy last summer), truffles, and other types of candies. I mastered cakes, also, and they were from scratch. 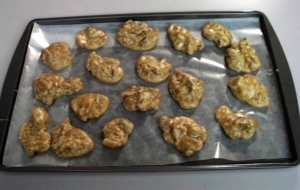 When I was introduced to pralines by a next door neighbor who brought some over one Christmas when I was probably in junior high school, I got the recipe and quickly learned to make great pralines. My little brother and I made them together for a while, and then as I grew up, I continued making them. This past Christmas I made the most perfect batch I've made in three years. They were fantastic, not not good for my insulin resistant body, so I don't make them often any more. We had company for Christmas, so I didn't eat them all, although I could have. I grew up and when I went to college, I majored in Home Economics. There I learned all about food preparation and cooking rules and methods. I learned the "why's" behind the recipes. I don't like to cook anymore because it interferes with my gardening, my photography, making jewelry and dichroic pendants, and all of the things I'm involved in. But pralines are the magic candies of Christmas, and because I love them so, I created this page to share them with the world wide web. I've gotten letters from lots of people saying that this recipe or that is their favorite and turned out great. I also get letters from people who have problems getting them to turn out right. Be sure to measure correctly all of your ingredients. Bring them to a slow boil, stirring occasionally to wipe the sugar granules from the sides of the saucepan. DO NOT stir them AT ALL after they come to a boil or they will be very grainy and sugary and not be good at all even if they do get hard. Use a fairly thick saucepan, not a really thin one. Use a fairly large saucepan. Once the liquid comes to a boil, turn the heat down so that there is a slow boil. Depending upon the humidity in the air, the time before the liquid gets to the correct temperature can vary slightly. Use a candy thermometer. Do not let the bulb of the thermometer touch the bottom of the pan while cooking. It usually takes a while for the temperature to reach the soft boil line (239 º). If it reaches 239 º, you won't have to beat it long at all. You can also master the art of dropping a drop of the mixture into a cup of cold water. If it spreads out, it isn't ready. If it stays together in a "hard goo" stage, it is ready. Take them off the burner and add the vanilla, butter and pecans. Then stir and slightly beat the candy until it is ready. How can you tell that it is ready? It takes practice. You want to stir until the candy starts to lose its sheen. You can drop a small test praline on a sheet of waxed paper. If it seems to hold its shape and looks like it is starting to harden, go ahead and drop the rest. If it flattens and falls apart when you try to pick it up, it isn't ready. This is something you just have to learn to "sense". If it doesn't look quite ready, stir/beat a little longer. THERE IS A FINE LINE IN STOPPING AT THE RIGHT TIME AND BEATING TOO LONG. THEY CAN HARDEN IN A SECOND AND YOU WON'T BE ABLE TO DROP THEM AT ALL. If it looks like they may harden too fast, quickly add 1 - 2 T. hot water to the mix and stir it in fast. Then drop them on the waxed paper quickly, and I do mean quickly. The wax from the waxed paper melts onto a counter surface, so I suggest putting newspaper under the waxed paper. I suggest that you may want to practice a few times using a few pecans and not a lot, and use the "Childhood Pralines" recipe because it doesn't use as much sugar, and no cream or butter. They are still good. When you get them right, go for the larger batches. Q. Why did my pralines turn out to be grainy and sugary? A. You stirred them while they were boililng. Q. Why did my mixture harden before I could drop them onto waxed paper? A. You either cooked them too long, or beat them too long. Q. Why did my pralines never harden? They are soft and sticky. A. You didn't cook them long enough or beat them long enough or both. Q. Why do my pralines have little white flecks on the smooth surfaces? A. Pat yourself on the back. At least they hardened. Probably because you cooked them at too high a temperature. Boiling is boiling, whether it is a rolling boil or a soft boil. Water boils at 212 º at sea level. Other liquids have their boiling temperatures. It won't make them cook any faster at a rolling boil than at a soft boil. It you boil the pralines hard it may stir up "boiling scum" which could be the cause of the white flecks. Q. I made a large batch of pralines. They were gone so fast I didn't get a chance to give any away as gifts? Can I make a double batch next time? A. Congratulations! They must have been really good. No, I would not advise anyone to double the batch unless you are very experienced at making pralines. I don't.. This extra bit of information came from the newspaper I write for as a freelance writer. The reporter was Andrea Yeager, who was writing about chef Bill Hahne, who used to be the chef at the Radisson Hotel in New Orleans. For a time, he was instructed to make enough pralines give to each guest with turndown service instead of mints. He had to make two pralines per guest each night until the manager one day saw how much work was involved. Have everything ready before starting. Have ingredients all measured and ready. Add the vanilla last, as it makes them creamy. Pralines are very hot, so don't set the pan down on a counter without protecting it. The thermometer should read exactly 239º, or the Soft Boil line, for pralines to set up nicely. If you go over that temperature and the candy forms a hard ball or thin threads when it is dropped into cold water, it has cooked too long. Combine all ingredients except pecans and vanilla. Bring to a boil. Add pecans, bring to 239 degrees. Remove from heat, stir in vanilla, then stir until mixtures thickens and becomes creamy and cloudy. Spoon onto buttered waxed paper. Andrea Yeager, "Keys to good pralines right temperature". The Sun Herald, May 14, 1997. Background music: "Still, Still, Still"
This page was created on December 26, 1999. All praline photos and instructions on this page have been created by me and are copyrighted 1999 - 2009. They may not be copied, downloaded, or used in any manner, print or electronic, without permission.